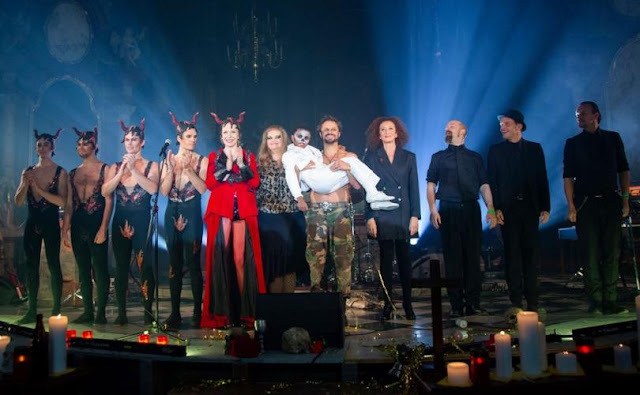 Christoph Schönborn, Cardinal Archbishop of Vienna recently let St. Stephen's Cathedral for a "rock" music concert featuring a homosexualist Philipp Hochmair pictured above standing on the Communion Rail. No cause can, not even the "sacred" rite of AIDS fundraising can justify this blasphemy and sacrilege. What must the laity do to win back our faith and our churches from these rotten men, these wolves, these putrid, effeminate malefactors such as Christoph Schönborn? Are there any Catholics left in Vienna? Are you in Vienna all so corrupted that you cannot see the evil that Schönborn has done by this act? Yet, what can one expect when the Bishop or Rome allowed a light show to be flashed on St. Peter's Basilica on the Feast of the Immaculate Conception? The evil stench comes from Bergoglio to all these filthy monsters. Remember that the malefactor Schönborn, is a great theologian, just like Kasper and that Bergoglio said we should look to him for the correct interpretation of Amoris Laetitia. This is just plain evil. If nothing else, it is up to whatever few Catholics are left to publicize this and mock this filthy cleric Schönborn until he repents and does public reparation for this scandal. They don't hide their Satanic Rituals anymore. They are 'OUT AND PROUD' with them, as they say. 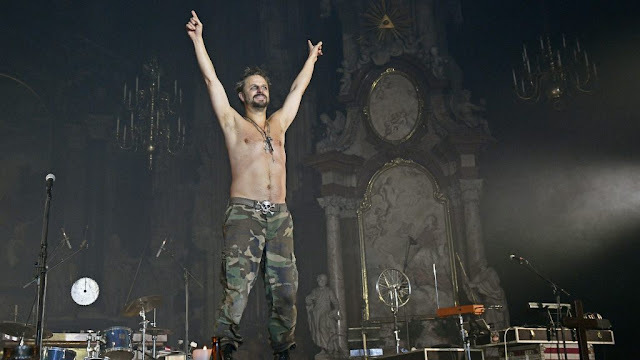 I mean, seriously, would any prelate within the Church of Christ even dream of putting on this diabolical display (INSIDE his Cathedral no less) if he was not in fact a practicing Satanist?! Some speculative food for thought. Speaking of b.s., see the news that Francis pick Fr. Martin is encouraging new rosary mysteries featuring environmental and LGBTQ themes? Welcome to Brave New Church... embrace or be excommunicated!!!! The true sacrilege and blasphemy occured many decades ago with the introduction of the Novus Ordo false mass. The responsibility for the sins of fathers should not be visited on the sons...but the Schorborn family of old Austrian aristocrats haven't got much to boast about. For many years this aristo family were an oppressive force on the life of the struggling peasantry in the Slovak and Hungarian borderlands. The commies weren't much better but at least they gave the Schorborns the boot. And they say Vienna is a paradise. The Abomination of Desolation is well and truly in the Holy Place. Resignation without total renunciation is invalid, so the still largely papal Benedict is still Pope. As long as Bergy's "papacy" is not outed for the usurpation and fraud that it is by everyone from the Cardinals on down to the laity, he and his pervchurch will continue and increase the atrocities like the one in Vienna's Stefansdom! The Baby Jesus bless and protect us!! In ref to “Ademar’s” comment about invalid Papal resignation, invalid Papal election; invalid Papal programs: if anyone can look at this and all that has preceded this evil event, and doubt an antipope reigns on St. Peter’s Throne, then they must know they are complicit in this and everything else. We are without excuse. Just because a “Pope” and his Cardinals promote this homo-eroticism and Satanic chuckles at the holy altar of God does not mean we have to accept it as part of Sacred Tradition; a venerable addition to the Deposit of Faith. We have eyes, ears, brain. This is anti-Christ. There is no way around it. The man behind all this is no Pope. *All* evidence is against him. Satan, the Father of Lies, is adept at getting otherwise faithful, orthodox Catholics to not only accept the lies at the heart of all that is holy, but to participate in their promotion and advance. Truly skilled, he is. Deadly, dangerously skilled. It is a stunning thing to see - this almost visible evidence of Satan on earth. And Catholics High to Low accept, explain, promote it with him; call those who resist the most blatant heresy in Catholic history the heretics. It cannot be an accident the poor child is put in such a helpless pose, and dressed in white to represent his actual innocence. These people really are demonic. The mask on the child's face looks like the skullwork in Celine Dion's latest moneymaking scheme, Satan-garb. It is not enough for these demons to participate in evil, they involve our sweet children. God help, keep, and protect children. It is not to be borne. This is positively Satanic, no Catholic of any kind should condone this. Our church is in the hands of Satan himself, there is no use kidding ourselves. 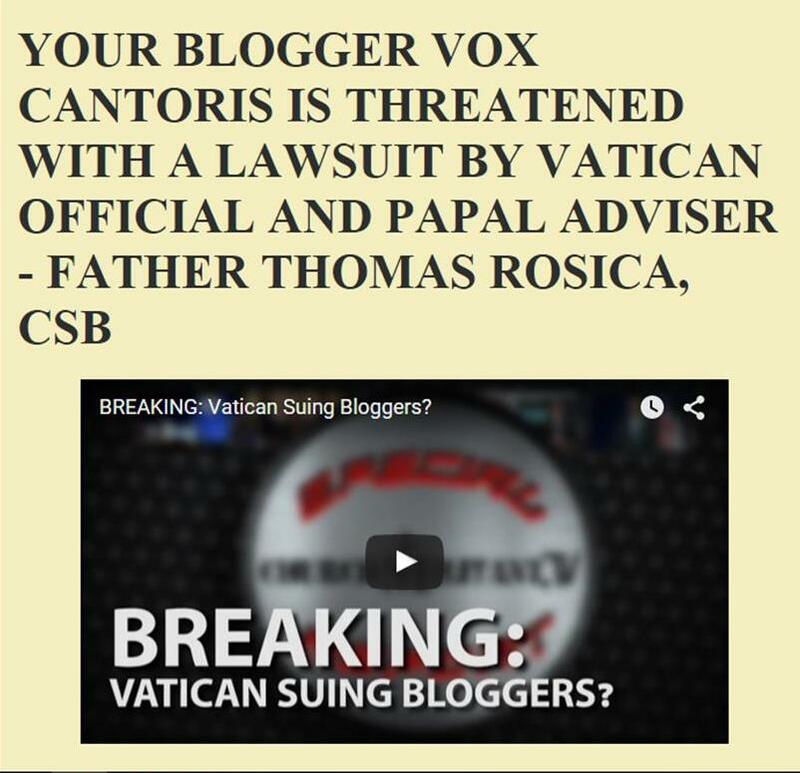 Anonymous 11:14, the I suggest you and any of your associates boycott Vox Cantoris. However, is it not true, were it not for Schonborn staging this desecration of the Cathedral, there would have been no need for this post? So, why do you attack the Vox? Should you not be more concerned with this blasphemy? The fact that this event can take place, and have no reaction from churchmen tells us something. If a bishop dared to stage a de facto Luciferian event in a church even 20 years ago, he would have been removed. Should you not be scandalized anonymous that the Holy Father has not removed Schonborn? The fact is that blaspheming the Blessed Sacrament, and profaning the Altar is a far worse sin than sexual abuse. If our Holy Father removed the abuser in Chile, should be not remove the spiritual abuser in Austria? We have to start seeing things the way God sees them. These men need to be in charge of theatres not Churches ,they have totally lost any sense of the Sacred ,it's hard to believe they believe in anything. Thank you Barona. When we see people who wish to silence the voice of opposition to blasphemy and outrage, we know we are dealing with Satan in one form or another. Some prefer to live in ignorant bliss and prefer a polite lie to the truth, others actually approve of such demonic activities or do them themselves. God bless Vox. This blog does a great service, and is truly needed. Christ formed 12 Apostals to start His Church, they were enlightened by the The Holy Spirit, their wisdom came from God where does a theologian's wisdom come from ? A man made degree might instill knowledge, but it does not guarantee wisdom.